A round-up of all improvements and changes to the Buzz platform in version v3.0.106 available on March 28, 2019. Added a feature to the manage enrollments screen that prevents duplicate enrollments. Updated assessments to include the option of hiding answers when a student is allowed to retry an assessment. 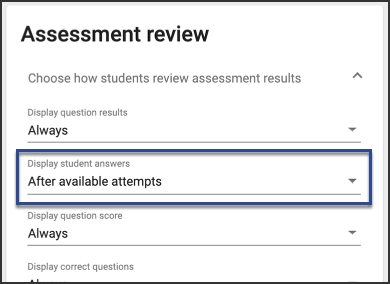 To enable, go to Assessment activity editor > Settings > Assessment review and set the Display student answers dropdown to After available attempts. 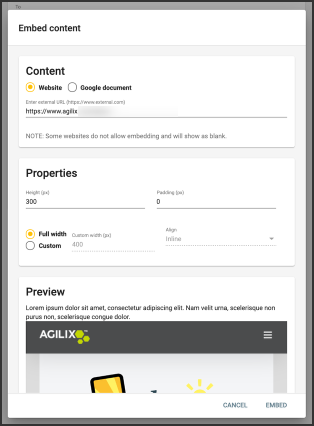 Updated the rubric editor to match the Buzz Material Design UI. 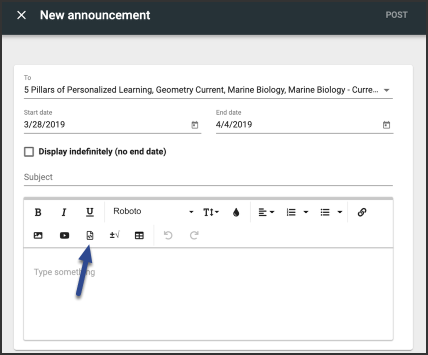 Enhanced announcement editor to support embedding content (e.g., Google documents, external websites) in Teacher Announcements and Admin Announcements. Select either Website or Google document, define the Properties, and Embed. Fixed an activity-player issue where observers could not view activities that were marked "visible to observers and teachers." Fixed an issue where updates made to course templates using the Admin bulk editor would not always be applied. Updated the button on the drop enrollment confirmation dialog to read Drop instead of Delete. Updated the course data displayed for master courses in the admin app to better align with each user's permissions. Fixed an issue where the Clipboard was asking for confirmation that the user wanted to leave unsaved changes to a message after the message was successfully sent. Fixed an issue in the Activity Editor where editing the URL for an LTI activity would also uncheck the "LTI" checkbox. Fixed a styling issue in the Activity Editor for LTI activities. Updates in version 2019.03.27.3716. Learn more. Item Data: A new condition for examreviewrules, /studentcanretake, determining whether the student can take or retake an assessment. ListCourses: Fixed an issue where courses in a deleted domain could have been returned if the user making the request was enrolled in the course. Where do you find the option of hiding answers when a student is allowed to retry an assessment? I've done a little exploring and have not located it. I've updated the article to show how to enable this, Larissa. Thank you for the question!